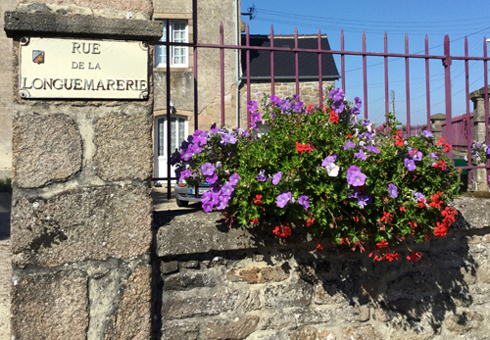 la Rue de la Longuemarerie in Saint Pierre Église, really is a remarkable road. 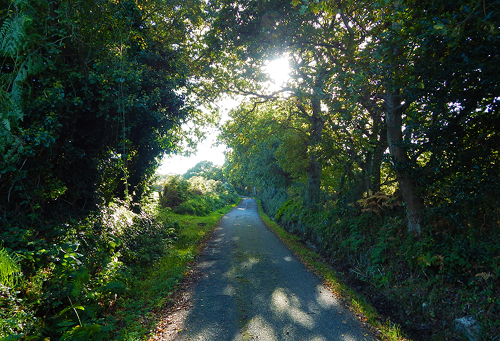 This short Single-track lane has seen human habitation on it for over 3000 years. 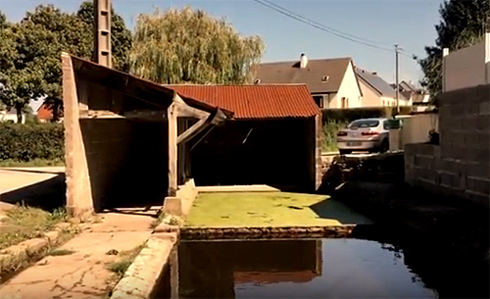 The road begins at one of the old wash-houses known as a "lavoir" they were used from the 17th to the early 20th century. Over the road is the road sign Impasse de Tues Vaques roughly translates as the impasse of cow killers And refers to the long gone railway that cut through the fields. You can probably guess the rest. Known locally as the Magic Oak this tree is about 400years old. The oak became the sacred tree of the druids. In fact the old Celtic word for tree, "déru" became our word for Druid. 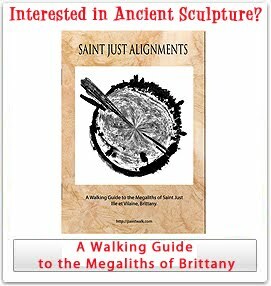 The Ancient Gauls would meet under the oak trees for guidance when danger threatened and the Druids would eat the acorns of the oak for the purpose of divination. 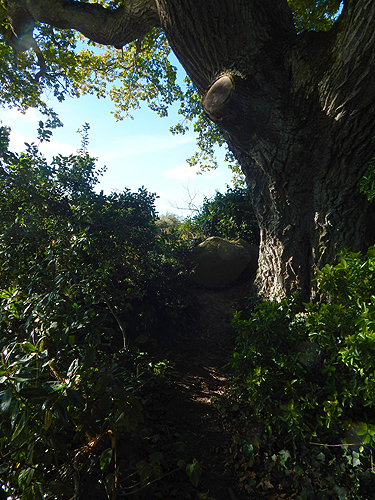 At the base of the tree you might notice the large rocks and these look a lot like abandoned or ploughed up Menhirs. In traditional folk tales the oak can take away fevers or illness from a person, even sacrificing itself in order to cure the patients suffering. 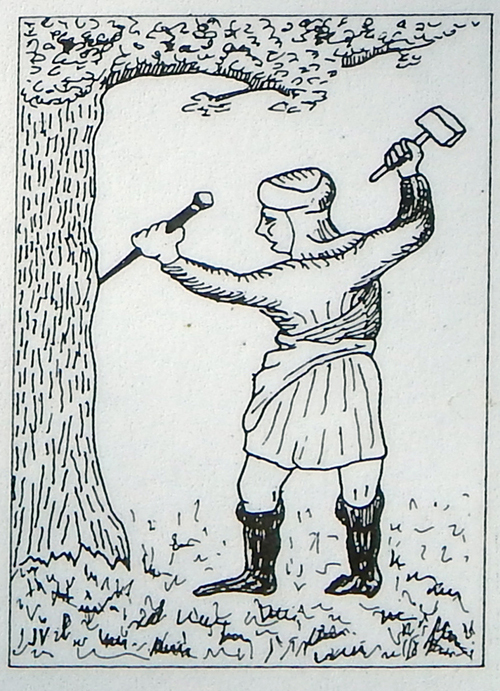 “By planting a nail that has pierced your body into the oak you will avoid infections. Apparently this treatment also works for horses”. As we walk a little further down the lane we come to the first of the standing Menhirs. It's about 1.3 metres high and on the opposite side of the road from the oak tree. I have found another smaller Menhir by a goat shed, and there may well be more of them in the area or perhaps some that have been removed for ploughing. Nearby on the left hand side of the road, we come to the main attraction. 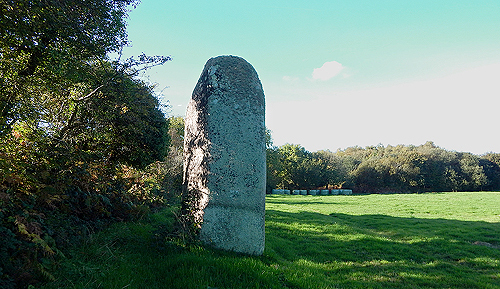 This is the long Pierre a massive quartz granite, standing stone in the adjoining field. It was built in the Neolithic period from about (5000 - 2500 B.C) the period of time when the hunter gatherers settled and became part farmers. Because of its unusual shape The Long Man changes its aspect depending on which side you view it, with one side favouring a triangular shape and the other a rectangular domed shape. The long man Menhir stands 4 metres above the ground and is placed at a depth of 1 and a half metres. The base being triangular adds to its changing shape when you walk round it. The quartz in the rock reflects different colours as the light changes. The Rue de la Longuemarerie is probably less than 3/4 of a mile from one end to the other, and yet there is some sense of security here when you take in that people have been happy to live here for possibly 4 and a half thousand years.